My idea of a paywall for the blog has hit something of a rough spot. Of course anything worth having carries with it challenges, so obviously I haven't given up. It might sound undiplomatic, but the truth of the matter is I think I need a higher class of reader. Please, though, dear ones, don't get me wrong. The basic run of the mill reader, Joe Average, Walt Wimp, is just fine. I have no problem with him or her. 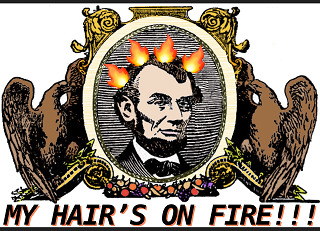 But there's always that few -- like burrs in your underpants -- who ruin it for everyone. Like right now, I have a mild headache, thanks to this one idiot, and in this condition I don't know if I can go on. I might have to postpone this post till tomorrow, or maybe even next week, till it goes away. Which isn't good for anyone. I don't think I made any secret of it that I wasn't all that gung ho for the Daily subscription plan in the first place. Think of the bookwork and trouble it'd be for me, handling all these paywall issues by hand, to be setting people up, only to have their subscription end tomorrow. Plus, what's 100 bucks a day? A dribble, a little bit of nothing. I need more money than that. Anyway, the guy was "resigned" to the fact that now he would "have to go with the Weekly option," at, for him, a "torturous" $700/week. I thought this, but I didn't say it to him, I'll show you torture! I'll terminate the Weekly option, too. Then you'll go for the Monthly, Yearly, or Lifetime, or you'll be out of here. So earlier today I made that executive decision, by fiat, No more Weekly option! I did it in anger. But on reflection, it seems only right to do away with it. Really, all it was was the Daily option x 7. If I had 100 subscribers at $700 a week, even though that's arguably still a good chunk of change, imagine how they'd keep me hopping trying to keep their subscriptions in place, up to date, and so forth. Again, with the bookwork I wouldn't even have time to sleep. Or, with me out spending their money, I wouldn't even have time for the bookwork, or to write. So the guy did me a favor, I guess, even though he meant it for evil. That's a funny thing about evil. Right when they think they're screwing you over, they're actually creating a monster, albeit in this case a more clear-thinking monster, who will screw them over. Thanks, buddy, but you're potentially out! Now, I have one major problem. And it's the strangest matter of timing I've ever heard of. I should laugh, is this ever a matter of timing! It's about blowing my mind, after having tied it in knots. Because it involves guys who were at the South Pole in the 1920s, simultaneously trying to subscribe to my blog while not even existing anymore. I can't untie that one! And I'm not going to try, except to say I'll probably keep the money. OK, here's the sequence of events as best as I can reconstruct them. 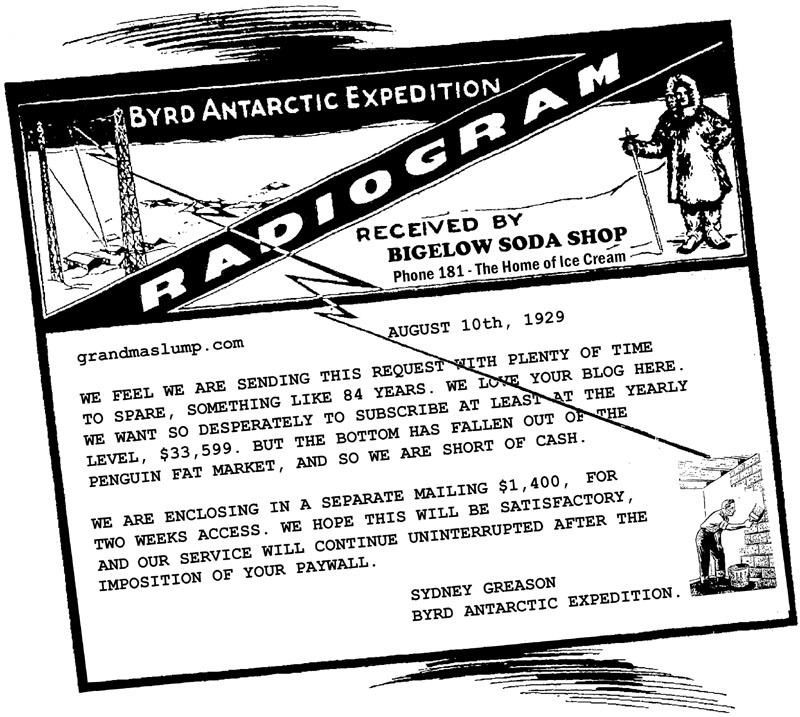 The guy cheesed me off, then I ended the Weekly option, then the Radiogram from Admiral Byrd came in, along with a check from the expeditionary team in Antarctica for $1,400. The sequence doesn't shake out in any other order. If only I had not decided to end the Weekly option! 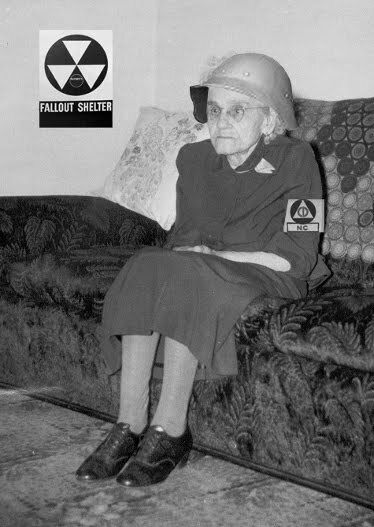 Or if the Radiogram and check had come five seconds prior to that decision! But I'm like the Medes and Persians, once I decide, that's it. So Byrd's out. I won't process his two week subscription. And it breaks my heart a little, but the policy's in place. I almost feel like I should make an exception for these guys. After all, they somehow managed to cross 80+ years of time and even transcended death to get their subscription in. But my decision is to hang tough. There can't be that many guys like that, but if I start making exceptions today, who will it be tomorrow? Julius Caesar, Schickelgruber himself? Once I break the rule, it'd be tough to adhere to it in the future. 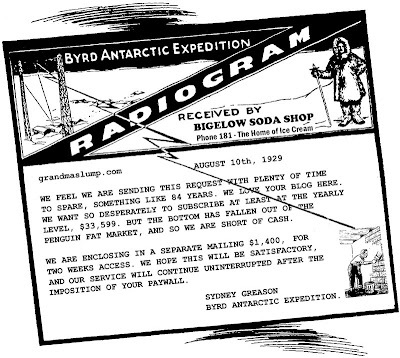 I'm not going to be able to figure out the riddle of it, how they could've sent a radiogram about my blog in 1929, and a check for $1,400 drawn on Antarctica's largest bank, 20-some years before I was born, and have it all show up this week while I've been writing about my paywall. You'd almost think there was something bigger than all of us at work there. A force? Maybe ... but if so, why didn't it allow them to get it to me before I decided to end the Weekly option? As great as it all is, they missed it by a full two hours. My suspicion is this could be just neighborhood kids, messing with me. They've seen so many science fiction movies, their heads are swimming with schemes. Rockets to the moon, harvesting dead bodies for food, two headed men, pinball machines that take over the world. Admiral Byrd back from the dead? It's ridiculous. And yet, the kids around here.... They're not smart enough to pull that off, are they? They barely know which guy's their dad. I called Lil at the Bigelow and she said the Radiogram came in just like all the others. The ones announcing the end of World War II last month and the one in April about Lincoln being killed. I'm just going to let it go. What do I care? I looked it up online and Byrd and his team aren't even in Antarctica anymore. Haven't been for years. He died in 1957, meaning this $1,400 check is ... dare I hope? ... found money. For some reason, who cares what, the expedition decided in 1929 to send me money. They were crazy enough to go to Antarctica to live, where there's nothing worth living for, so it only stands to reason they might be nutty enough to send random money to random people yet to be born. But whatever access to the blog they think they're owed, and their Radiogram does appear to specifically address that as their desire, shall be denied. UPDATE: I've gotten notes from a few of you that this Radiogram was a fake, because it's signed Sydney Greason, a guy you never heard of. I'm sorry you don't know the basic facts of anything. I would've assumed that everyone knew, since it's something I learned in Kindergarten, that Sydney Greason was one of Byrd's chief underlings, for a time, before losing the post ... that same year ... 1929. Hey, what if Byrd was pissed at him for sending the money, then not getting access? After all, from their point of view all this has already happened.